I.R. satellite imagery is showing significant cloud top warming. We believe that Celia is now much weaker, even though it takes time for the winds of a huricane to "spin down". The trend for weakening will likely continue as Celia moves farther and farther from mexico. Celia is not a threat to Mexico. 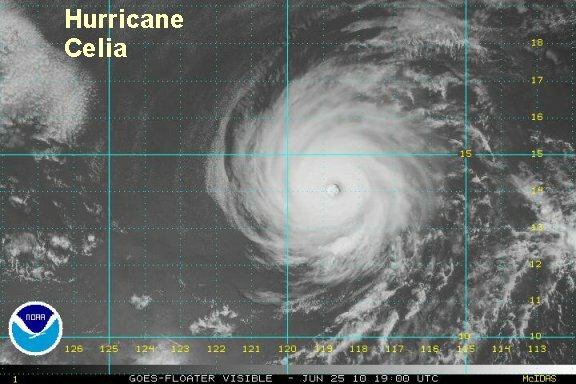 As of 4:00 pm edt / 1:00 pm pdt hurricane Celia was centered at 14.3°N / 118.8°W or about 825 miles southwest of Cabo San Lucas. Movement is to the west northwest at 13 mph. Top sustatined winds are estimated at 120 mph (NHC 135 mph). I.R. 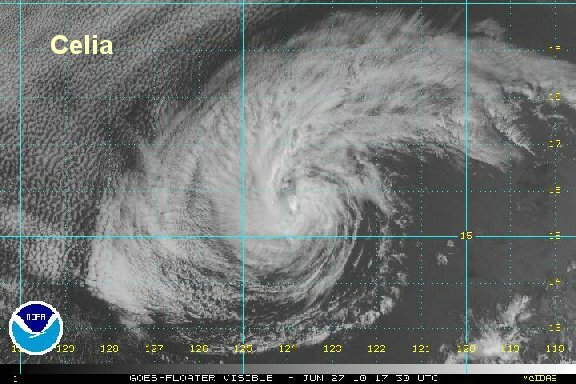 satellite imagery is still showing a weakening trend for Celia. It will lose its energy source of warm tropical waters the next few days as it moves farther from Mexico. Our 90 mph wind estimate is based on a recent satellite estimate as well as the eye still being farily well intact. Celia is not a threat to Mexico or any other land areas. This will be our last update on Celia. 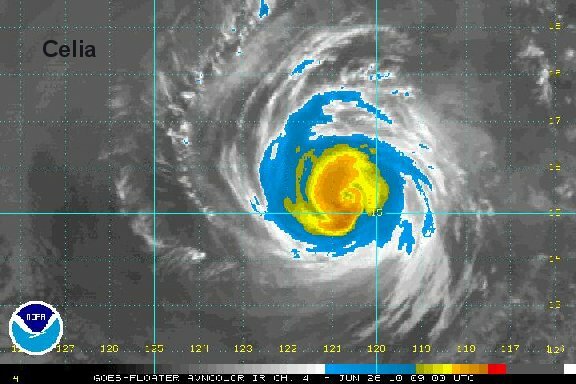 As of 5:00 am edt / 2:00 am pdt hurricane Celia was centered at 15.3°N / 120.7°W or about 880 miles southwest of Cabo San Lucas. Movement is to the west northwest at 10 mph. Top sustatined winds are estimated at 90 mph (NHC 100 mph).